So what is that thing. When I find myself asking that question while walking around a flea market, I know that I will most likely be buying whatever it is. In the never ending quest to keep myself entertained, I like to go treasure hunting at flea markets. I find things from time to time and end up selling them on Ebay. I like getting out and walking around and there is a certain satisfaction to finding something cheap that I can later turn into a little money. Last week I was at Uncle Bill's Flea Market in-between Sylva and Bryson City North Carolina. Not the biggest flea market and being the middle of winter, there were very few venders. I spied a tool that I did not recognize. It seemed old and I had never seen one before. I asked the seller what it was and he didn't know. He was asking $12 and after talking to him for a while I paid $2 and went on my way. I usually find a tool seller at the market and show it to them in an effort to id the tool. He had no idea. I asked all the old timers and could not find an answer. In looking at the tool, one side has a shaft that appears to be a brace bit. For all of you who don't know what a brace is, it is a hand drill you crank. They were used before there was electricity and used a tapered squared off end to hold the drill bits. The other end of the tool had the business end of a brace on it. That is the part of the brace that holds a bit. I was narrowing it down. In the middle there was a cross piece that was threaded and had a chain attached. My first guess was some sort of puller. Unfortunately there were no manufacture name on the tool. I went to the computer and started searching. Eventually I discovered that it is designed to hold fast a brace drill bit as in drills into a metal pipe. I am still not sure what to call it. I next went back to the internet and started looking at patent sites. 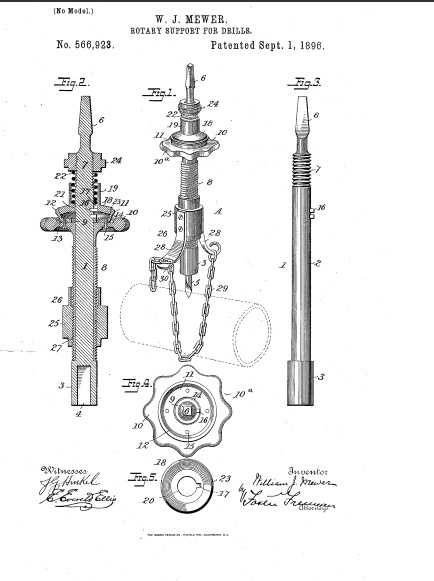 I found a couple of patents that had date ranges from the 1790's to the 1920's. 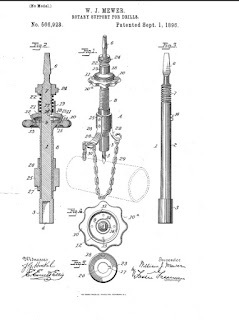 This is an image of the device from one of the many patent applications on file. This one is from 1895. The chain was wrapped around a pipe and placed in the catch on the opposite side. The threads were then used to tighten the drill bit up against the pipe and help hold it in place as the drill was turned. I have no idea how much it is worth. Probably not too much, especially since there is no name on the tool. But you never know. I am going to put it on Ebay and see if I can get my $2 back.